Apple Engineers Working Overtime on iOS 7's 'DeForstallization' - iPhone.MY - Daily News On Mac, iPhone, iPads, iPods and more! Under the direction of Jony Ive, who took charge of Apple’s user interface teams last October, iOS 7’s redesign is said to be “flatter” with fewer skeuomorphic design cues and an interface that focuses on simplicity. Skeuomorphism, a real-world design concept that was favored by former Apple senior vice president of iOS software Scott Forstall, is found in many of Apple’s default iOS apps. 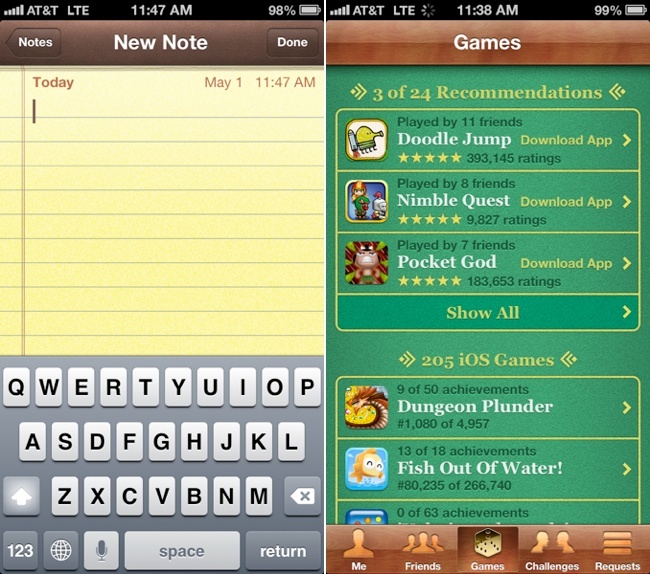 For example, apps like Notes and Find My Friends both feature leather design accents and Game Center offers up a felt pool table texture. These are all elements that are expected to be removed in iOS 7, as AllThingsD points out in a new report covering the design changes. As noted by AllThingsD, Apple’s iOS has not had a serious design overhaul since the original iPhone was released in 2007, making it long overdue for an update. If the company has good ideas for design tweaks, it’s about time it implemented them. With new mobile operating systems like BlackBerry 10 and Windows Phone proving that there’s plenty of room left for innovation in the market, Apple can ill afford even the risk of the perception that iOS might be getting dusty. Apple’s challenge, then, is to overhaul the look and feel of the OS while retaining the intuitiveness that’s made it so popular. According to a report from Bloomberg earlier today, Apple has been forced to delay its internal timelines for iOS 7, but the company’s engineers are said to be working overtime to get a preview ready for the upcoming Worldwide Developers Conference in June. Multiple sources have indicated that Apple is pulling engineers from OS X 10.9 to help the company stay on schedule with iOS 7.